Confession: I am a bicycle addict. I’m on my bike far more than I’m in a car, and that’s the way I like it. Riding on two wheels helps me fulfill my need for exercise, manage my weight, clear my head, spend time alone, spend time with friends, challenge my limits, save money, and more. If you're a fellow bike addict, or are thinking of becoming one (May is national "Ride to Work" month), here are some of my favorite cycling books to help you along. 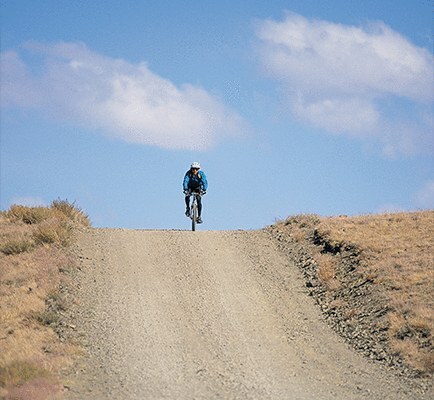 Miles from Nowhere: A Round-the-Word Bicycle Adventure. This is one of my favorite stories of all time. And it rests entirely on the affection you immediately begin having for Barbara Savage, the author. She’s tough, she’s open, she’s kind, and very real. Set in the late ‘70s, Barbara and her husband Larry head out on a two-year around the world ride on classic ten speeds, wearing tennis shoes, cotton clothes, and garbage bags for rain suits—no fancy gear of any kind for this couple as they pump their way across the US, Europe, North Africa, Asia and back home. Barbara’s narrative pulls you in, leaving you wanting the ride to never end. This is perhaps the best bicycle-touring story I've ever read, and I’ve read a number of them. The Bar Mitzvah and the Beast: One Family’s Cross-Country Ride of Passage by Bike. Another favorite story. That there are three plot threads running through this family bike-touring adventure made it really interesting to me and that the author is hilarious made it a page turner. With his son reaching Bar Mitzvah age and wanting to celebrate that passage in a nontraditional way, Matt Biers-Ariel plans a cross-country bike trip with Yonah. And not to be left behind, wife Djina and little brother Solomon also join the fun. The result is a trip in which funny things happen constantly, serious conversations turn esoteric, everybody argues, and signatures are collected on a petition along the route in support of reining in climate change. Anyone who loves the complexity of family relationships and happy endings will enjoy this book. Cycling the Pacific Coast: The Complete Guide from Canada to Mexico. This is the new version of one of our most popular guidebooks, which had been used by tens of thousands of cyclists across four editions. This book is not the fifth edition of that previous book; rather, it’s completely rewritten by a different author, and is a fresh new take on the country’s most popular long-distance bike tour. Whether you want to ride pieces of this route, or all 2000 miles from Canada to Mexico, you’ll find riding directions, side trips, camping and lodging options, breathtaking coastal scenery, and much, much more. Cycling the Great Divide: From Canada to Mexico on North America’s Premier Long-Distance Mountain Bike Route, 2nd Ed. Like the Pacific Coast bike route, the Great Divide is another dream trip from Canada to Mexico through the Rockies, on forest services roads and single track. The route is 2700 miles long and Mike McCoy, the author, knows it better than anyone, since he helped link it all together. Mike has the entire trip broken into 70 days, with camping and lodging information, as well as food and water tips, turn-by-turn directions and more. The Adventure Cycling Association (ACA) has more than 100 bike-touring maps available to guide you on adventures in every direction. With more than 50,000 members, ACA has been the primary creator of cycling routes and their maps since the 1970s. 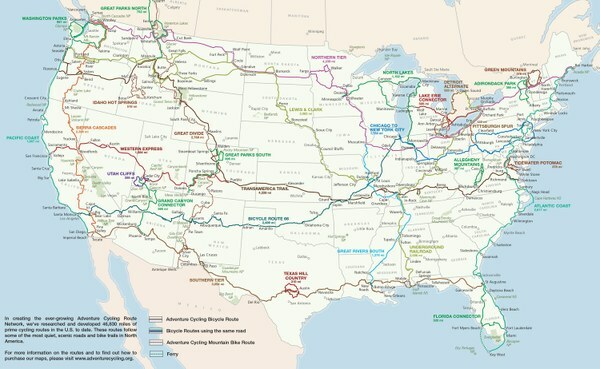 They offer map sets, for example, for four cross-country trips, including different ways to connect to those, and many other shorter bike trips with historical themes, special scenery, loop rides, off-road trips, and more. Mountaineers Books is ACA’s map distributor to retail outlets and via our website. ACA also sells maps from their own website, Adventurecycling.org. If you’re new to cycling and not sure how to start, read Urban Cycling: How to Get to Work, Save Money, and Use Your Bike for City Living. by Adventure Cycling Association and Michael McCoy.